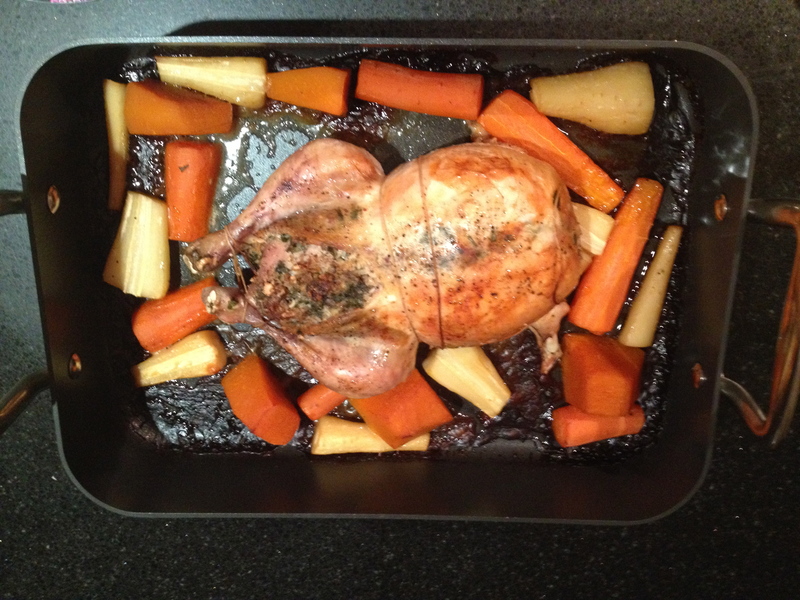 Multi bird roast – Why not! Today is Saturday. It’s a beautiful Saturday and I spent the morning at soccer with my son Alex. I did a line. He scored 3 goals. The team won 5-2, but that really doesn’t matter. He’s in U8’s and it’s all about the kids having fun. It’s late autumn in Canberra but the sun was shining and it was a spectacular morning to be outside. They have team photos in a couple of weeks and I bet it will be -5 degrees and sleeting, no doubt. After a wonderful morning at soccer and a good hour back at home wrestling on the lounge room floor, Alex and I headed to the markets. A typical Saturday. We had lunch at Ace Sushi and they had Alex’s thongs that he left there last time we were there, which was last week. We go there almost every week I’m in Canberra and I was reminded just how much we follow our habits. I thought about this as we went to Beppe’s cafe and got a coffee and a hot chocolate to take away while we got our fruit and veg, just like pretty much every Saturday. I like being a creature of habit, it’s natural, it’s comforting and when your habits are good ones, it’s healthy. But every now and then you have to do something different, something you’ve never done before. So as we went about our fruit and veg shopping just as we always do, I decided I wanted to cook something I’d never made before, something elaborate. Not because of a special event, not because we’ve got friends coming, just because making something new and special is fun. So tonight we are having a multi bird roast. I’ve always wanted to try doing a multi bird roast after seeing Hugh Fearnley-Whittingstall roast 10 birds stuffed inside each other for an indulgent River cottage Christmas dinner. At least I think that’s what it was, but it’s not important. 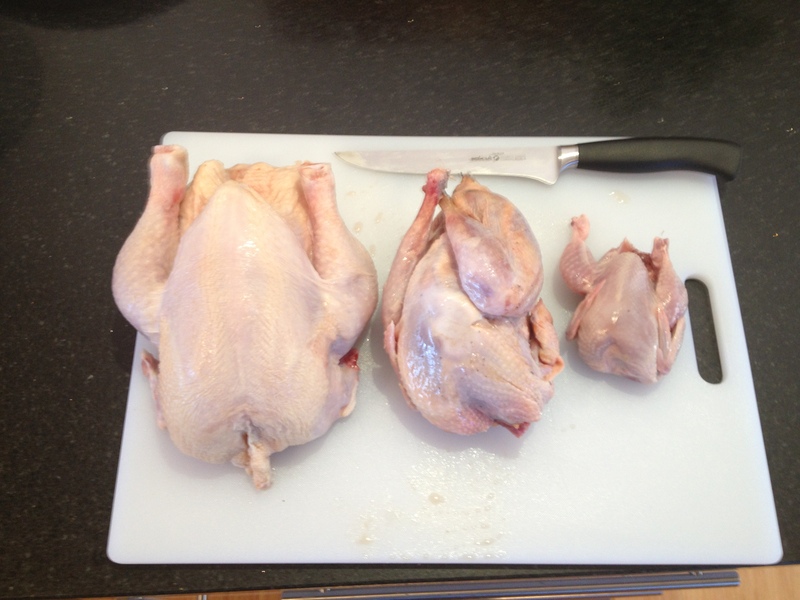 So I went to the cooking shop at my local markets, bought a good quality boning knife (I do love an impulse investment) and then went to Eco Meats, a fantastic butcher that I was sure would have a collection of birds to choose from. Exactly which ones to buy I wasn’t sure of, but given it was just Alex and I for dinner, I figured the smaller the better. 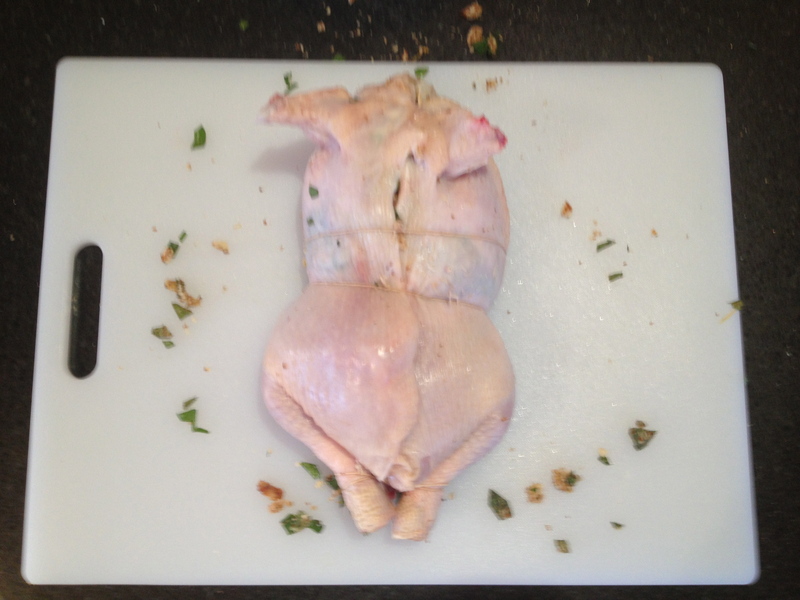 Maybe next time I’ll try the traditional 3 bird roast of a chicken, inside a duck, inside a turkey. Turducken! Today I went for a quail, which I could only buy in a tray of 6 but froze the rest for another time, a pheasant, that once I started boning was clearly corn fed but I didn’t have much choice, and a really good quality free range chicken. I guess you could call this one Chiphesail? I was pretty excited about trying this out but also a little apprehensive as I’d never boned a bird before, let alone 3, and of ever decreasing size. 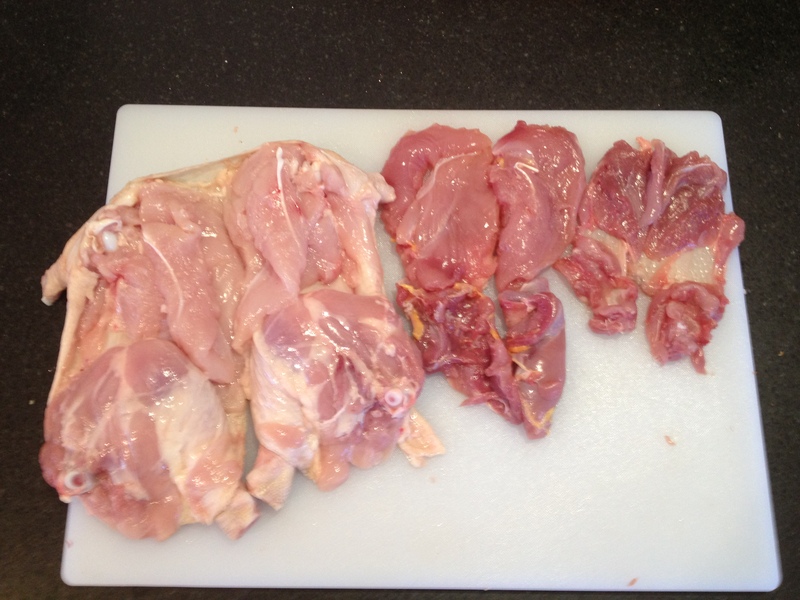 I started with the chicken and was pleasantly surprised at just how easy it was. I know that BBQ’s will never be the same again. Next was the pheasant which once again was pretty easy, although it’s breast bone was very different to the chicken and being a smaller bird, there’s less meat. The quail was last and whilst I thought it would be really tricky, again I was surprised at just how easy it was to bone. I didn’t bother trying to get anything off the wings and legs tips as there was plenty of meat on the body and thighs. Boning complete meant 3 carcasses into my stock pot, followed by some veg and a house filled with amazing smells. It’s one of the reasons I love cooking. Cooking smells wafting through the house makes a home just as much as photos on the walls. Alex and my neighbours son were busy in the rumpus room doing acrobatics on the spare mattresses and cushions they’d arranged, but little did they know they were also breathing in scents of home cooking, family and love. It was a great Saturday. Anyway I then needed a stuffing (Paleo of course) to go in between each layer. 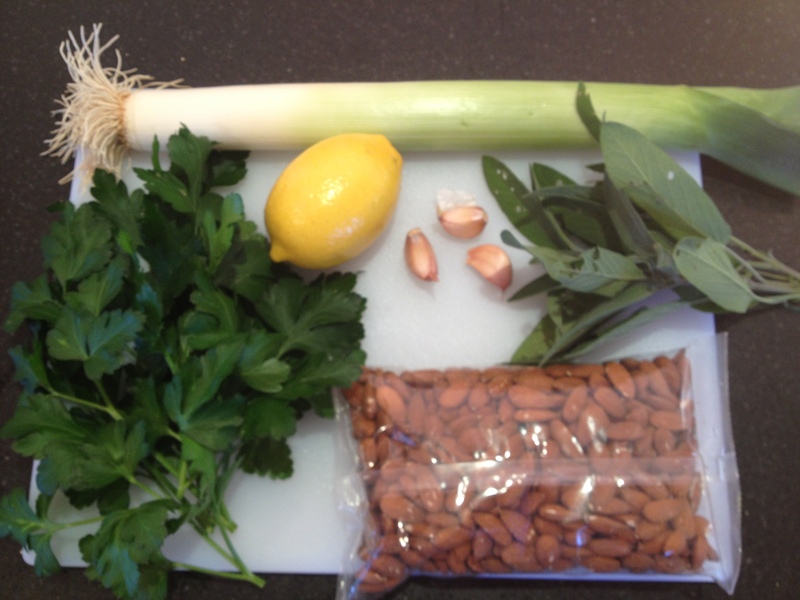 I threw some almonds into my coffer grinder, sweated off some leek in butter, crushed a few garlic cloves, added the zest of a lemon and grabbed a bunch of sage and Italian parsley from my garden. Chop and mix and bingo, 3 bird stuffing! Now it’s the fun part, putting it all together. The idea is to lay out some string and start with the largest bird, in this case the chicken on which I left the wings and legs, then add stuffing, the pheasant, more stuffing, the quail and finally a bit more stuffing. 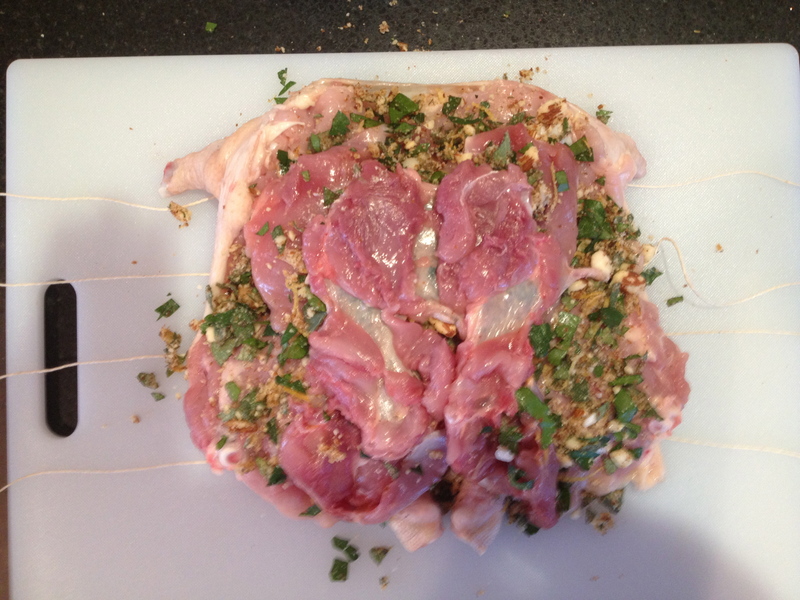 The end result is layers of bird and stuffing. Tie it all up and it now resembles (almost) a normal chicken. 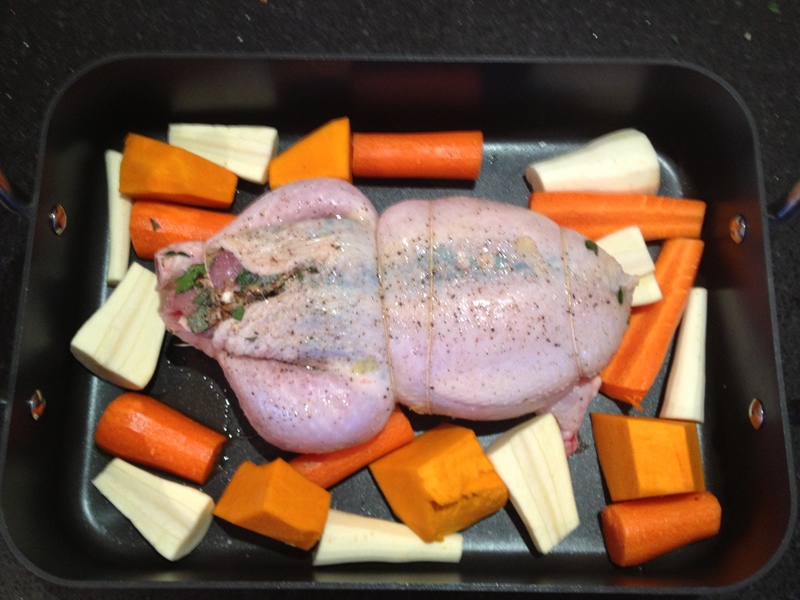 Drizzle with olive oil, sprinkle with salt and pepper and lay in a pan with carrots, parsnip and pumpkin. Cover and place into a low oven of 130 degrees for a long slow roast of at least 2 hours. I wanted to do this low and slow to retain moisture in the meat. Because of the low heat, I then par boiled orange and purple sweet potato before putting them in a pan and topping with duck fat I collected from my good friends Tim and Latha who last week roasted a duck on the webber. This went into the oven after about an hour of cooking time and should mean everything is ready together. Fingers crossed. After about 90 mins I took off the foil and turned the oven up to 150 degress so that some colour was imparted on the birds and the veg. It turned out pretty well. The end result was good but in reality a little overcooked. Next time I do this I’ll bake it for less time and keep it moist. I’m also going to try more and more birds in one. Maybe 5 next time. I love the idea of doing this with wild caught birds and will have to think about making it a festive dish and align it with hunting seasons for birds perhaps. I may never get to hunt birds though as this would need pretty good skills with the bow? One day perhaps? Just over 3 years ago I planted a range of fruit trees in my front yard. I put in a nectarine, peach and pear, all on dwarf stock, and a full size apricot, cherry and plum. Amazingly the nectarine and peach produced fruit from the very first summer and I continue to get around 20 mid sized fruits from both, which is pretty good. The pear has yet to produce fruit but gets hammered by sawfly grubs which may have something to do with it. I recently found a really good article on controlling them which has helped this year. Check it out here. As for the full sized trees, they’ve taken a little longer to become productive. I got a relatively small amount of apricots and plums last year, probably a couple of kilograms from each, and until this year nothing from the cherry. I was very pleased with a good couple of kilograms of cherries picked in early December even though the tree is still pretty small. It has suffered from cherry aphids this year which attack the young growing parts of the tree and cause them to curl and stunt the growth. Unfortunately I was away for many weekends over spring with volleyball and wasn’t aware of the problem until it was too late and the damage was done. Next year I’ll be ready for them and get the upper hand early on so am hoping for some good growth and additional cropping the following year. The plum fruited prolifically this year and it’s branches are drooping under the weight of the fruit even though it’s a couple of weeks away from being ripe. I estimate I’ll get more than 10 kilograms this year and it has grown well each season and gaining size quickly. So what about the apricot I hear you ask? Well a couple of days ago whilst sitting in my lounge reading a new cook book I got for Christmas (It’s called Whole Larder Love and is about a guy who decided to grow, hunt and eat his own food, very cool) I saw the tell tale signs of the apricots being ready to pick, birds! With the cherries you have to put netting on the keep the birds away because they’ll start eating them a bit before you want to pick and will strip the tree in no time flat. With apricots however, I use the birds to tell me when to pick as they tend to only come once the fruit is soft and golden. So I grabbed a bowl (a couple actually) and collected my bounty. The finished product should last the whole year in the pantry but refrigerate after opening. Perfect with Indian meals but also great with a simple steak. I have fond memories of diving around my lounge room floor playing catch with my dad. Not just because playing catch is fun, it certainly is. Not just because my hand eye coordination got pretty darn awesome helping me with all kinds of sports later in life. I have fond memories because it was time with my dad. He never seemed to tire of being with me as a kid and I now understand why. Investing time with your son (or daughter I’d imagine), seeing them happy, growing and learning is one of the most rewarding things you can do. Alex and I tossed a ball around for ages last night and absolutely loved every minute of it. We always do. And this kind of activity does wonders for hand eye coordination, peripheral vision and spatial awareness. Amongst the cheering, the challenging and the occasional apology for a bad throw, we also did a hell of a lot of laughing. So next time your kids have nothing to do, grab a tennis ball and some lounge room space. Get down on the floor and have some fun. You’ll be amazed at how quickly they start to pull off some awesome catches (we call them speckies, short for spectacular) and at just how much fun throwing a ball around can be. Especially when you start to really challenge each other. A couple of weeks ago I received an email outlining the need for “urgent” works to be undertaken on the footpath outside the building where I work. The email described the works as critical to render the paths safe for use. The funny thing was I remembered walking on one of the paths that morning and I didn’t seem to recall any dangerous chasms or pits, ledges or crumbling ravines. No matter I thought, clearly there was something I missed that really needed fixing. As I left work that afternoon I payed particular attention to the paths on the way out of the building and despite actually looking for a problem, still struggled to find any. I did notice that a couple of concrete slabs had risen a few centimetres in comparison to those next to them, but surely that wasn’t the critical, urgent works to which the all staff email referred? Turns out it was. The next morning I again paid particular attention to paths on the way into my office building and noticed that several of the “joins” where concrete sections meet had been ground down to make them totally flat. The danger apparently had been averted. A couple of weeks later I happened to mention this comical situation to a new staff member who had previously been in a site management position for the offices where I work. I alluded to the fact that I was a little bemused as to how a concrete join raising a few centimetres actually constituted a critical or urgent problem. Her respond simply blew me away. She explained that in fact the works were tendered following the hospitalisation of two staff in a two week period. I’ll repeat that to help it sink in, two people had been hospitalised after tripping on raised concrete joins and so this meant that we had to urgently grind down the paths to make them safe. Since when did the human being become so incapable of normal movement that walking across anything other than perfectly flat ground would pose any problem whatsoever, let alone put someone in hospital? If ever we needed evidence of a species in trouble, this is it. I’ve no doubt that the people who fell on the 2-3cm raised concrete joins that then caused a hospital stay were somewhat less than well conditioned. In fact I’d even go so far as to say that they were probably towards the bottom end of the human physical capability bell curve, at least I hope they are. But it did make me think about the life of the modern human and whether all the development and “progress” we have made since the industrial revolution has actually helped us to move, or caused us to start losing the ability altogether? Ask yourself this, what percentage of your life do you actually move on uneven ground? Now ask yourself another question. If you lived as a natural wild animal, in nature, when, if ever, would you find yourself on flat ground? In fact you wouldn’t have to go far back in history at all, probably only a hundred years or so, to realise that only a small percentage of our time would have ever been on flat ground. Movement in our modern world is entirely predictable. Our homes have flat floors, our roads and paths are perfectly flat, our buildings have flat floors and even our “nature” parks and reserves tend to have paths and boardwalks put in place to make moving “easy”. But is it really moving? Perhaps our desire to make things easy, to make “nature” accessible, and even to protect nature from the impact of people visiting it, is really causing significant problems for humanity? When I talk to people about what natural movement means, about what I do, I explain that I move and train in nature as a way of increasing my capabilities. Not only do I not avoid uneven ground or obstacles, I actively seek them out, because moving across and through challenging terrain is quite simply the most effective way of maintaining and increasing my movement capabilities. And because I do it barefoot I’m building my raw capabilities, available no matter what the situation. I’d love to think that the modern world will quickly realise the slippery slope it’s created for itself by developing the hell out of everything and flattening out our world. But it won’t really. I’d love to think that people will come to their senses and accept responsibility for there own physical incompetence, as opposed to blaming someone else for tripping on a raised paver, but this is unlikely too. At least in the short term. Still, if enough people stand up and question why all our terrain has to be flat (and boring) maybe we as a species can find our way out of the zoo we’ve created? Maybe. How does your weekly shop look? Today I’m issuing a challenge and one that might be harder than you think. My challenge is this. Next time you do your weekly (or fortnightly or monthly) shop, instead of putting it all away, lay it out on the bench and take a picture. Now ask yourself something. Are you happy with what it looks like? 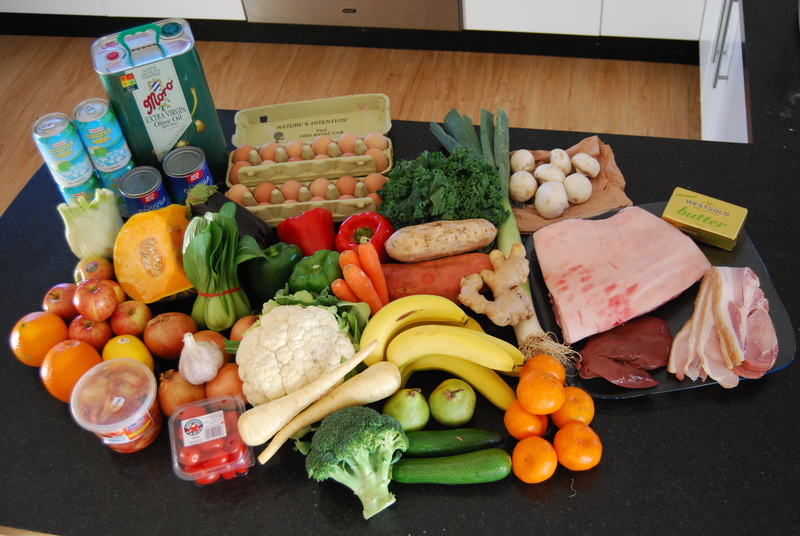 Are you happy with how your weekly shop looks? This is really meant to be a rhetorical challenge and it’s about having a good hard look at what you buy each week. However, if you’re either proud of where you’re at now, or courageous enough to perhaps post a “before” photo, why not put in on Facebook? Even better, post it to my Olliemoves page. You see every day we make choices about what we eat, what we do and how we take care of ourselves, but because they are small decisions we often don’t realise how they add up. My idea of laying out a weeks, or months food intake out to see is not new, it’s been done on countless diet/weight loss based reality TV shows, but it is still incredibly powerful. Before going Paleo I used to shop at the supermarket each week and regularly got depressed by aisle after aisle of processed crap that resembles food, as well as what people rolled up to the register with. Especially the ones with kids. I mean it’s one thing to feed yourself nothing but “food like products”, but to raise children on that crap? I’m tempted to take a tangent here and go on a rant about child abuse, but I won’t, cause that’s not the point of this post. So for at least a couple of years now my weekly shop has been at the fresh food markets. One of the things I love about the markets is that when you look around and notice what everyone else has in there trolley, they tend to have pretty healthy loads. I guess cause there’s not much alternative but also cause they are there for the same reason, to get real food. So the above picture is what my weekly shop looked like today. It’s not everything I’ll consume this week because I have a pantry full of spices and a garden full of herbs and veggies, but one thing worth noting is the lack of the need for “label” reading. I tend to work on the basis that if I need to read the label to see if something is healthy or not, it’s not really food anymore! For the record my shop includes includes; Extra virgin olive oil, coconut water, coconut milk, fennel, pumpkin, royal gala apples, oranges, a lemon, onions, garlic, Kimchi, grape tomatoes, broccoli, parsnips, cauliflower, bok choy, eggplant, a couple of dozen eggs, red capsicum, green capsicum, carrots, bananas, pears, lebanese cucumber, zucchini, mandarins, leek, ginger, orange sweet potato, white sweet potato, kale, mushrooms, Pork belly, butter, lambs liver and bacon. People who know me know that a lot of what I do in terms of “training” or “fitness” or “workouts” is very loosely associated with the conventional view of these terms. Actually what I’m really about is playing, exploring, and moving. I’m also very much about parenting. And to me good parenting means playing, exploring and moving – with your kids. Children use play to learn, its their job! It helps them to build the skills and competencies needed for adult life including physical, mental and social skills. Google “importance of play” and you’ll find stacks of supporting information on this, but when I reflect on my own experiences as a child, as an uncle and as a father, I know without doubt that playing with your kids is super healthy, super good for them and super good for you. Anyway this post was not meant to be about exploring all the developmental benefits of playing with your kids. There are oodles of them I’m sure and some basic research will give you plenty of scientific reasons to back up my laymen thoughts. But really, this post is just meant to get people thinking about investing, not spending, but investing more time with their kids and playing, exploring and moving. And this investment doesn’t have to cost anything but is really just about igniting the spirit of play, exploration and movement in order to connect with the same spirit in our kids. And I guarantee the return on that investment will be ten fold that of any material item bought for them. So what does play, exploring and moving with your kids look like? It’s only limited by your, and their, imaginations and the willingness to indulge. Make the decision to go with the flow and the rest just happens, but here a couple of examples that Alex and I have put together (literally, constructed, filmed and edited together which is also an awesome activity to do together) over the last couple of months. Enjoy! The first was a recent weekend at the beach. It’s winter in Australia and was about 16 degrees but beautifully sunny so we spent many hours playing in the water, the sand and that headland. And the second was a stop off at the local library whilst riding home from the mall.